This review originally appeared on rpg-resource.org.uk in February 2017 and was reprinted in the September/October 2017 issue. 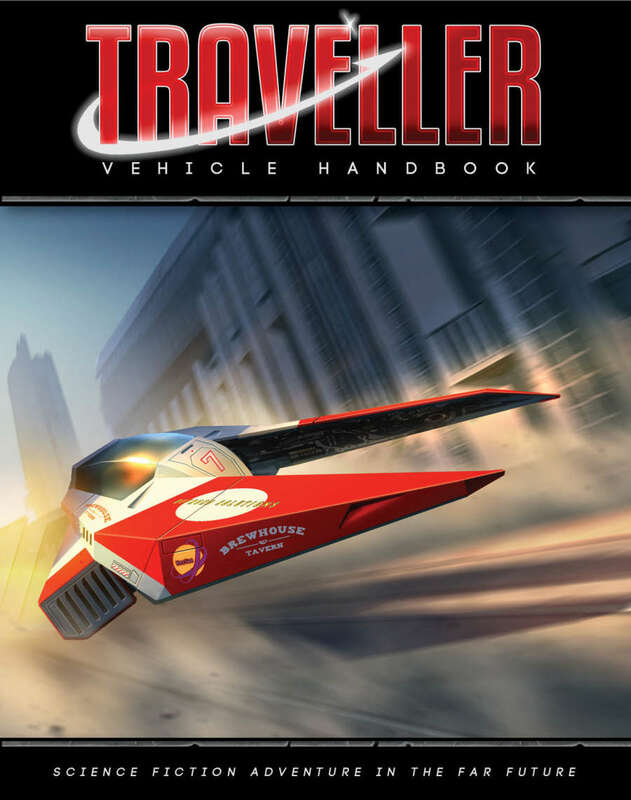 Mongoose Traveller 2nd Ed. Vehicle Handbook. Matthew Sprange. Spacecraft are all very well, but once you reach your destination, how do you get around? Having the appropriate land, sea and air vehicles can go a long way to making other planets feel real, alien, exotic… or whatever impression you are trying to get across. Vehicles can also be a source of adventure: perhaps it is hard to get hold of one when you need it, or maybe offworlders have to use a specific form of transport. Indeed, they can end up being the adventure: many years ago, a spectacular Traveller adventure was spawned at a Games Fair convention in the UK when a bunch of players decided that they weren’t staying around for the riot that had broken out and stole a groundcar… unfortunately none of them knew how to drive it, and their exploits on the way back to the starport became the stuff of legend! The Introduction lays out the purpose of the book clearly. The design system is straightforward and simple, but fits in with everything else so far published. It emphasizes what the vehicle can do, how fast it goes, and what it can carry. That’s what you need to know as far as game mechanics are concerned… most of the rest is window-dressing. Chapter 1: New Rules provides some additional rules that you’ll need to make it all work. There are notes about resupply and maintenance, sensors, detection of vehicles and even things like can the vehicle tow something else (or indeed, be towed)… and of course the pleasures and perils of the used vehicle market! They also may be specifically designed for a purpose: combat, say, or off-road operation. We then move on to Chapter 2: Vehicle Design. It’s a seven-stage process, very streamlined, and once you are used to it you can crank out new vehicles in a matter of minutes. Actual construction times and costs are likely to be a little more, though there are advantages to mass-production. Most parties will be looking to buy (or rent) rather than make their own vehicles from scratch, however. Starting with chassis type and tech level (stage 1), you then decide the number of ‘spaces’ the vehicle has (stage 2, which determines the basic parameters for the vehicle), add weapons and armour if required (stage 3), customise it if you want to (stage 4), work out how many crew are needed and passengers can be carried (stage 5), allocate cargo space (stage 6), and finalise your design (stage 7)… and you’re done! This is a toolkit rather than hard and fast rules, and the Referee is always at liberty to deviate if desired. An example (a fairly ordinary-looking ground vehicle, a rugged van basically) is worked through in detail to demonstrate the process, and the next four chapters go into more detail about chassis types, armour, weapons, and customisation. Grouped by basic chassis type—light ground vehicle through gravitics-powered and unpowered ones, then boats, submersible and aircraft—there are loads of options to help you come up with exactly what you need. You can even have ornithopters and walkers if you want. Armour is generally a case of strategically-placed plating, then on to weapons, as many and as varied as you can imagine. Weapons can be mounted in various manners, and a wide range of generic ones are provided… and then comes customisation. Your imagination is pretty much the limit, although there are suggestions galore and an in-character advertisement for a vehicle design consultancy! Next, things get a bit exotic with Chapter 7: Biotech. This may or may not be commonplace in your universe, or it may be very localised. The chapter assumes that it is rare but possible, and assumes it needs at least a TL10 world to create biotech vehicles, but that the biotech vehicles themselves operate two tech levels lower. If biotech is commonplace, you can ignore these restrictions. Again, maintenance and repair may be problematic if biotech is unusual, but straightforward if such vehicles are readily available. Some exotic chassis types and weapons are provided, but feel free to go wild! If your head is swimming with all the choices, never fear... the final section is Jayne’s Guide to Vehicles of Charted Space, a vast array of pre-generated vehicles of all sorts that you can use straight off… or customise a bit, first. Each one comes with a description, cost, appropriate statistics and an illustration. Conveniently, each occupies a single page so PDF users may print off just the pages they need. There does seem to be rather a lot of military vehicles, fine if you are equipping some mercenaries but of less use if you’ve just landed and want to go sightseeing! Overall, a robust system which meshes well with the rest of this ruleset… but in some ways a little uninspired. Consider the science fiction books you’ve read or films you have seen. Describe the vehicles in them… sometimes troubling to codify everything bogs you down. OK, so you need to know how fast it goes and what it can carry, how much damage its weapon does... as for the rest, let your imagination run riot. This system will let you slot in whatsoever numbers and game mechanics you need.